We have a really fun Card Challenge this week at SSC. Ready? Using the word "Spring" you must make a card using the following supplies. I hope you'll join us and play along too!!! Next up, is a 4x4 card. I really can't stop making these. 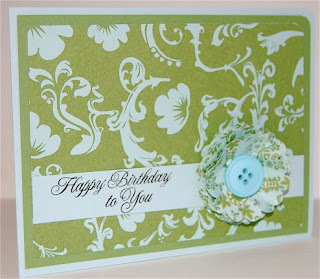 I used a smaller dot flourish and the flowers to make a fun cluster around the bottom and side of my top layer. 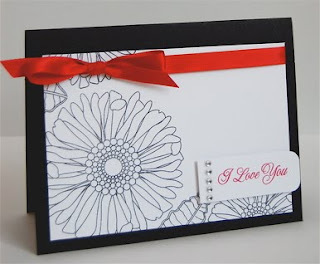 To make the two toned flowers, I inked up my stamp in Ruby Red, stamped off onto my grid paper and then rolled the outside of the flower back in the the Ruby Red ink. I also added some leaves to the flowers. 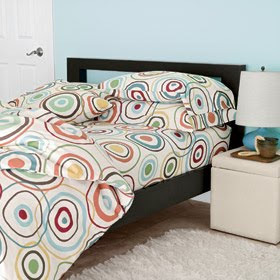 Isn't this a fun bedroom, not for myself, but the kids. I just love how fun and funky it is :) Our challenge was to use the colors in this picture and circles. I happen to be roaming around Walmart (yes, Walmart, I'm not embarrassed. It's the only "local" store and it's still 20 minutes away!) and saw these cute stamps. I thought of this challenge and had the get them (they were only $4 dollars, how could I pass them up?). I just knew they'd be perfect for this challenge!!! I love this color combo, not something I ever would have put together myself, but it totally works. I love having to think outside the box. I'll definitely use these colors again. I recently made my first purchase from My Time Made Easy. I've been following Lauren Meader for a couple of years and was thrilled when she launched her own company. She is so talented and such an inspiration!! This months release just spoke to me! 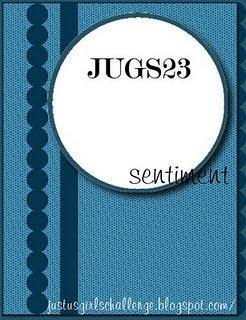 I have been looking for an all purpose sentiment set F-O-R-E-V-E-R!! Something that can be used inside and out. I don't really have a stamping budget (*sigh*), so I have to choose the sets I purchase wisely. 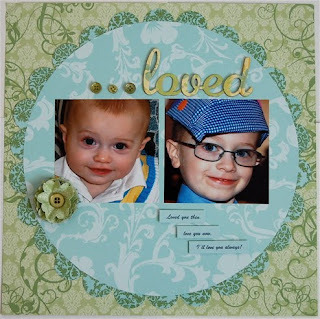 I don't need a whole set with birthday stamps, or baby stamps...well, Lauren did it, FINALLY, in all her brilliance she designed, what is in my opinion, the perfect all occasion sentiment stamp, "So Sentimental". That set along with "Fanciful Flourishes" were must haves for me. This was my first attempt with my new sets. I was sick and down for the count this past weekend but, I had to rip them out of the package and start using them right away. (So, please excuse the adhesive that is showing, oh, that bothers me!) I always have a hard time starting out with a new set. I think I just have so many ideas running around in my head that I can't put anything together on paper. I envision so many different cards with these two sets, oh, I just love them. The quality is awesome! The images are crisp and clear upon first use. I'm definitely impressed!! This was Easter Weekend, just about 4 years ago. Ugh, there are just so many things "wrong" here. Through this stage of scrapping I was obsessed with making sure I scrapped EVERY picture. Seriously, was that necessary? Um, no! I also made sure that every page coordinated. 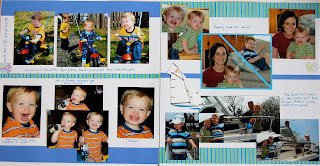 I never put two pages together in my album unless they somehow coordinated. How things have changed! 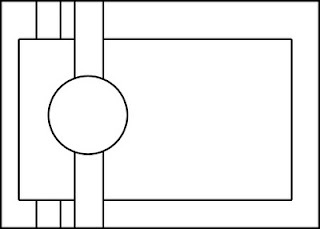 I was also a big fan of the diagonally split photo. Head over to Pryn's blog (So Not Mocha-vated) on my Sidebar to play along. Have no fear!! Today, I bring you a Springy SSC Color Combo Challenge. 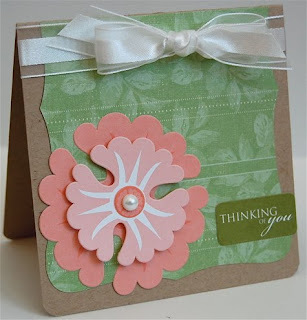 The SSC Design Team Gals made some really beautiful samples this week. Head over and see how they interpreted the colors. Short post, I haven't been feeling so hot. I'll be back to post my supplies later. Have a good one! 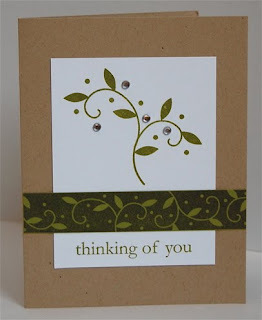 Clare, a fellow SSC Design Team Gal, challenged us to make a card using our favorite tool or embellishment. Well, I used them all! 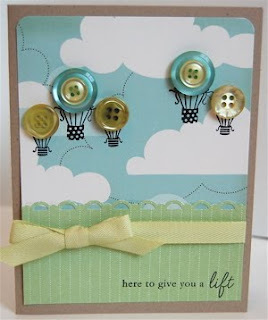 My favorite crafty things change from time to time, but today they are: buttons (of course), bows, my Stampin' Up! edge punch and my corner rounder. I've had the idea for this card in my head for a while. I had only planned to have 3 hot air balloons, however I got black ink on my paper (urgh!) and had to add a couple more for fancy cover-ups! That's all for now, thanks for coming by and thanks for the fun challenge Clare! I am horrible at sending out thank you's from my kids. I totally admit it!! 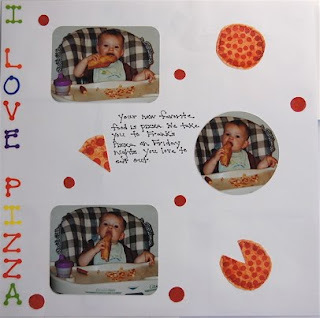 Using the CPS sketch #155, I made a thank you for Conner to send out for his birthday presents. It's STILL sitting on the counter!! His birthday was on Feb.17th, isn't it awful?! I really have got to work on that!! Have a fab weekend everyone!! Enjoy this awesome Spring weather while it lasts!!! Just about!! With the snow almost all melted, the warm air and the sunshine, it certainly feels like Spring. And what better way to start out the new season than with a bright color combo. 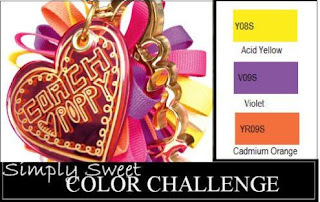 Honestly, at first glance (and maybe second, third, fourth...lol) I thought, "What on earth am I going to do with these colors?" 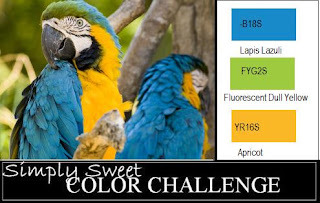 The challenge is for THESE colors to dominate with only 10% or less of neutrals. Yikes...After a couple of tries, I came up with this card. I'd love to see what you come up with!! 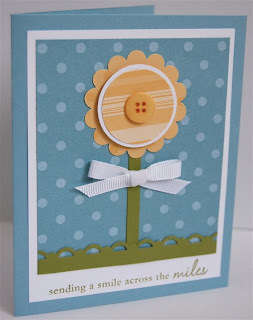 I hope this card brightens your day! Happy(almost)Spring!! What really jumped out for me was that big scroll. 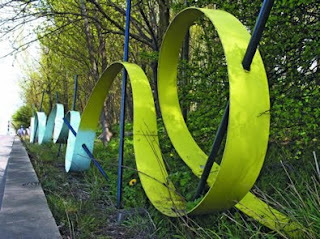 I was also inspired by the greens and blues and nature. So, are you going to play along too? I can't wait to see what you create! Here we go again! 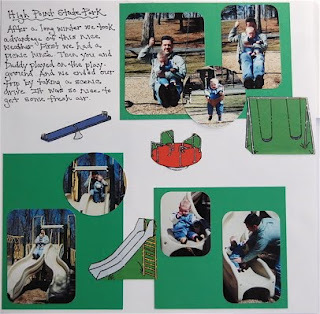 I'm playing along with Pryn's Throwback Tuesday's! 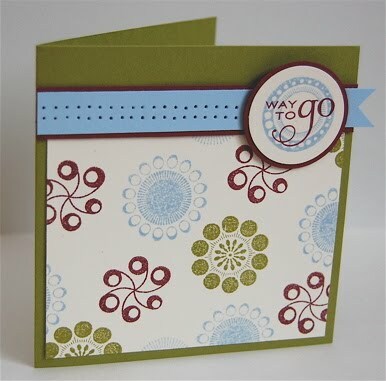 I made this layout shortly after being introduced to stamping. Hmmm, have you noticed I don't really stamp on my layout's these days? THIS is why, oh my!! 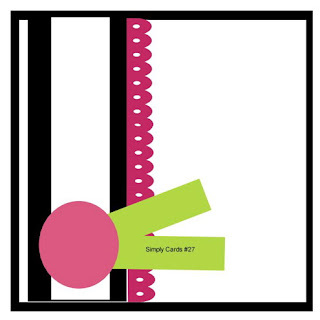 This was also during my phase of cutting squares on an angle and putting them in every corner. 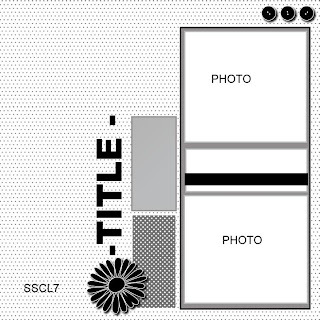 Seriously, I did this on every layout for like a year. It must have been the only "technique" I knew, lol!!! 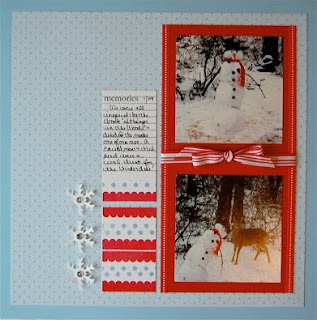 Visit Pryn at "So Not Mocha-vated" on my side bar to see more throwback layouts!! ***This is a horrible photograph, the weather here is rain, rain & more rain (better than snow!). Sorry! The snow was so heavy that day that our snowman started to collapse, but I was able to get a shot of a deer enjoying our treats before it fell!! This is now a winter tradition that we all enjoy. "Stanger in the Woods" has become a family favorite too!! I kept the layout pretty simple, I really wanted the photos to stand out and chose red on the light blue to make them pop. 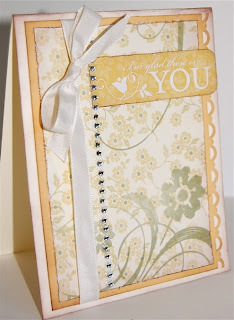 I made a journaling tag and patterned paper using PTI Journaling Lines Polka Dot Basics and Beyond Basic Borders. I punched out some snowflakes and added rhinestones for the finishing touch. Have a great Sunday. Don't forget to spring ahead! I didn't mean to leave that last post up for so long!!! This weeks Card Challenge over at SSC was a technique: distressing. I tend to distress a lot so this was easy peasy!! 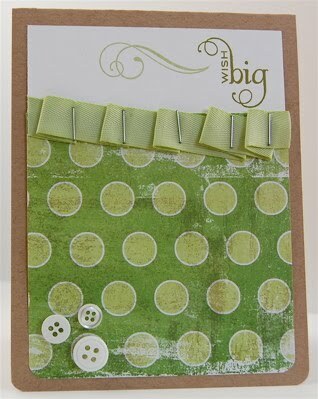 I wanted to try making my own patterned paper with Polka Dot Basics. It looks so cute. 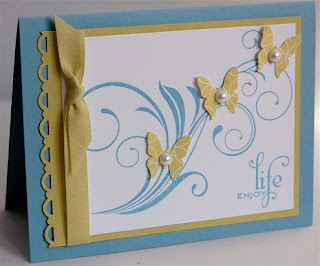 I happen to be going to a baby shower tomorrow, so this card is going right into an envelope :) I love when I actually get to USE the cards I make. Most of the time they sit in my stamping room and collect dust. I was thrilled when a friend asked if I'd be willing to donate some cards for a fundraiser for a young girl with cancer, OF COURSE!!! I collected 40+ cards and can't wait to give them to her. What do you do with all of the cards you make? Do you actually send them out? Donate them? Can't wait for some good ideas girls! Color is such an inspiration. We use it in so many ways in our everyday lives, decorating our home, dressing ourselves, cooking...etc. It even has an impact on our moods! 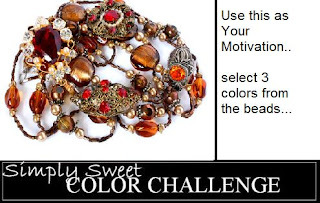 Check out this weeks SSC Color Challenge. How does this inspire you? 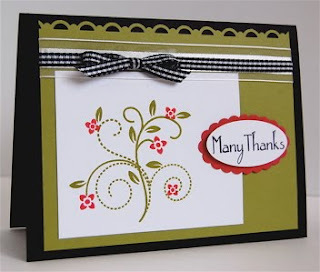 I used all scraps for this card. I love doing that! 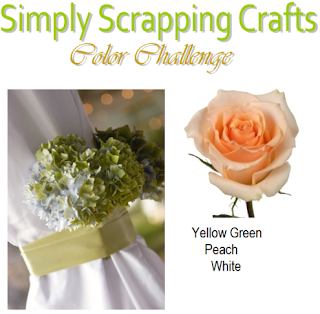 Make sure to stop over and see what the rest of the SSC Design Team Gals did with the challenge. First up, Sketch Saturday. It's an awesome sketch to work with! I had fun with this. 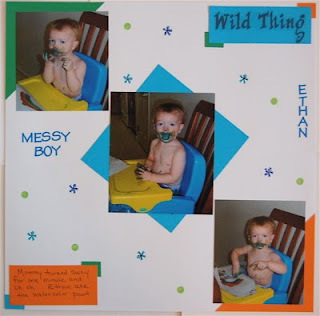 This is Ethan at 6 months and 4 1/2 years old. Journaling reads: Loved you then, Love you now, I'll love you always. Next up, is the March Wild Card Wednesday Challenge. Our challenge this month was to make a card or layout using green. I chose this beautiful leaf image from PTI's Beyond Basic Borders. 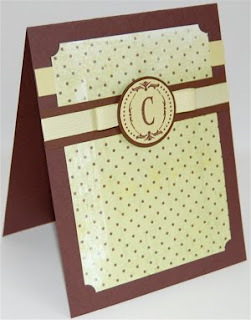 I love how eay it is to make a CAS yet elegant card with their stamps. 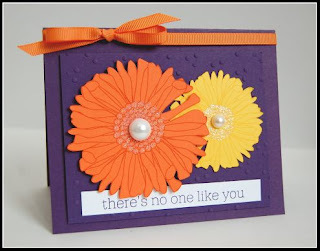 Tomorrow another Color & Card Challenge posts. Stop by to see what we have for you this week...have a fabulous night & enjoy this gorgeous weather. 52 never felt soooo good :) See ya! While searching for inspiration, in hopes of finding my mojo along the way, I came across this weeks Just Us Girls Challenge. I thought I'd give this one a try. I've had this paper in my stash for years and it just kind of spoke to me. I tried to go with a bit of a shabby chic feel...hmmm, Still not thrilled and really hoping my mojo returns soon. I think my problem is that I don't have a plan. I usually have an idea of something in my head, a stamp set or paper, etc. Yesterday, I just didn't. All supplies SU! except rhinestone strip from unknown manufacturer. I hope everyone is having a great weekend. We had a fabulous, relaxing day with my sister-in-law yesterday. Today, while the boys were outside playing, I headed to my stamping room and found that my mojo is missing today. What happened? How does this happen some days? 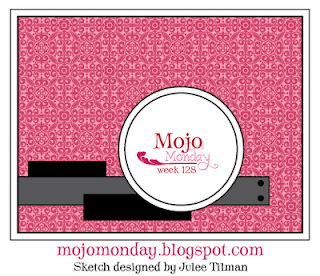 hmmm...I turned to the Mojo sketch (128) hoping it would help, um, not so much. It's not awful or anything, I'm just feeling uninspired. It's just blah! What do you do when you lose your mojo? The colors this week are GORGEOUS!! I want those beads!! This is my Mom as a baby. Isn't she precious? She looks like a little doll! I have had this picture since I was a little girl and I thought would look beautiful with this color combo. For quite some time, I've been attempting an album just for me. I have layouts of my great-grandparents to layouts of me and my husband dating, etc. It's a hard one to work on, but every once in a while I add to it. 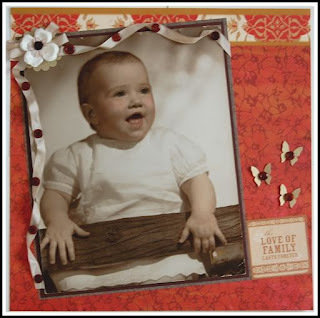 I seem to get so wrapped up in scrapping the kids, that I forget about myself :( I decided that one day the kids would want to know about me & their ancestors...and so it began! This beauty is was meant to go in the album, however, I'm going to frame this one and hang it in my stamping room, it's always been a part of my decor and it's a little piece of home...A reminder of where I came from. Having this piece of home means more than you know. Wow, I'm long winded this morning! I have more to say on that, but that will be for another day. Mom, my biggest fan, I hope you like it!! Love you! Good morning! I hope everyone has had a great start to their week. I have to admit, I was happy to get everyone packed up for school yesterday so that I could get a little time to myself. We were all home from Tuesday until Monday, phew! I didn't do anything special, just errands & stuff, but I was alone, ahhh!! With so many days snowed in the house, I had plenty of time to craft! This was a super quick card to make, just my style, CAS! 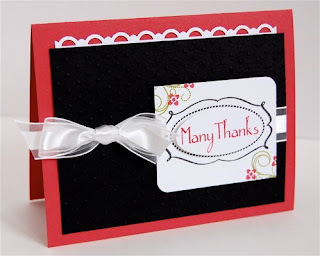 I've been seeing a lot of black and white cards lately and I find it so striking with the pop of red.